The life of a leading Quaker derived from her reminiscences and those of her sister and her husband, supplemented by other material. Eleanore Price Mather (1910-1985) grew up in Rose Valley, Pennsylvania, near Pendle Hill. She attended Providence Meeting and studied at Westtown School, Mount Holyoke College and the University of Delaware. She returned to the neighborhood of Pendle Hill after college and helped to edit the Pendle Hill Pamphlet Series. Her best known editorial work during this time was Barclay in Brief. 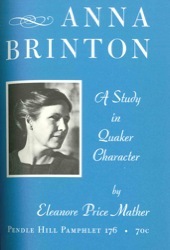 In addition to her editorial work, she wrote Pendle Hill: a Quaker Experiment in Education and Community as well as a biographical pamphlet on the life and work of Anna Cox Brinton (PHP #176). She also wrote a number of pieces on the life and work of Edward Hicks, including Edward Hicks: Primitive Quaker (PHP #170). She was active with the Friends Historical Association and Historic Delaware County Incorporated.